Spring tends to bring everyone out of hibernation mode. If you happen to live in a colder climate, chances are your children are already bouncing off the walls at the chance of getting outside and getting some fresh air. And if you’re like most parents, chances are you can’t wait to get them outside as well to burn off some of that never ending energy. Family activities can be expensive, though. It seems like everything costs an arm and a leg these days. Even a dinner out for a family of four can cost more than some families can comfortably afford on a regular basis. Too often we forgo creative activities for the simplicity of staying indoors and vegging out. But I encourage you to get your family outside to enjoy the spring weather. Being on a budget doesn’t mean having to skip family outings. 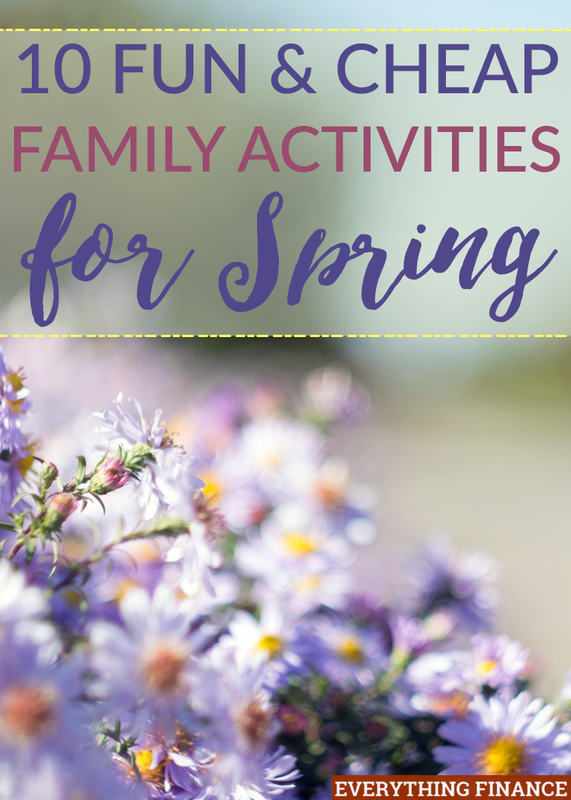 Here are 10 fun and cheap family activities for the spring. For kids, it’s most likely cheaper to buy used bikes on Craigslist, especially when they outgrow them so quickly. Get your kids some used bikes and go for a family bike ride around your local neighborhood. Who knows, you may find some spots you’ve never discovered before when in your car! There is a lot of bikes available under $500, so don´t be worried about budget at all. Take the unbeaten path and saddle up your children for a hike to explore nature and get in tune with the great outdoors. Why settle for movie theaters and indoor activities? Instead, let your children go nuts outside for free! Pack up your lunch and choose a scenic spot in your city. Do a Google search for some great picnic spots by you. Children will love the novelty of eating outside. Any bodies of water near you? Suit up the children in their swimsuits and let them enjoy the water, or go canoeing or kayaking. Take out all your camping gear and set it up in your backyard. Playing pretend was one of my favorite things as a child, and chances are they will enjoy a night out among the stars. If you don’t have a tent, build a little fort! Visit your local dollar store and stock up on $10 worth of craft supplies. See what creativity your kids can come up with when their budget is $10! Get your camera and pick a local flower field for your own private family photo session. Some children love having their photo taken and being the center of mom and dad’s attention for a while. Are there any national parks near you? Pack up the kids and take a short road trip to visit a national park and see the wildlife. Too often we get stuck in the routine of going to the same local playground over and over. But cities actually have several playgrounds that are different. Children love getting to play in new playgrounds with new equipment. Make it a point to explore outside your neighborhood for some fresh scenery. Many cities offer free swim sessions at local neighborhood pools. Help your kids perfect their breaststroke by spending an afternoon at the pool. What are some of your favorite and cheap family activities for the spring? What do your children love to do day in and day out? Do you try and get them outside more often?